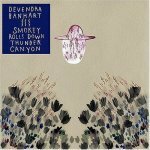 Devendra Banhart is a name often shrouded in mystery and myth. Many are still puzzled that Devendra Banhart is the man's name, not the name of a band or some sort of ironic moniker. With Smokey Rolls Down Thunder Canyon, Banhart's 5th album in as many years, the curious songsmith has created another timeless record that fits just as easily into this decade as it would have some forty years ago. Sure, he uses an outlandish blend of styles, including, but never limited to: calypso boogies, traditional folk progressions, some archetypical rock n' roll flares, spacey psych-rock, and even hints of doo-wop, but somehow this unlikely jumble manages to make sense. Breathing a decidedly different atmosphere than his previous releases, this album is mature and finds Banhart ditching his off-the-cuff delivery for a more reserved sound. He drifts away from the stream of consciousness method of writing and recording he previously relied on. Keeping folk contemporaries like Noah Georgeson in tow for fuller arrangements, songs like So Long Old Bean add playful background la la la's along with newfound uses of overdubbing and panning. Still presented in a collective, "this just sort of came together" manner, Banhart no longer wavers out in front of his backing band. His voice falls deeper in the mix, melding with and running alongside the music. Banhart's tone has also changed; think bad crooner doing his best and worst Elvis impression at the same time. Just as vocally dexterous, his singing now contains more gravity than guffaw. Still embracing his Venezuelan roots Banhart starts the album off with Cristobal, a chamber lullaby of distant chanting. It's all very hazy, dreamy and less playful than 2005's Cripple Crow, expanding on previous hints of a wounded Banhart's more vulnerable side. "I ain't waiting but I'm still holdin' on," He professes on Bad Girl. At the same time he obviously hasn't forgotten how to have fun. Only Banhart could get away with something like Shabop Shalom where he recites a tale of Jewish heritage in a professional health-class-video voice before breaking into boozy vocals and a lovingly audacious claim that he wrote the Dead Sea scrolls. On Seahorse Banhart finally takes the plunge into the psych-rock world, raising tantalizing fantasies of future side projects. The song is deceiving when it begins like any of Banhart's others, breezy with a few dark contours until the final act when he unexpectedly breaks out an electric guitar. Perhaps just to show us that he can rock if he wants to, Banhart channels the spirit of a more ramshackle, but less proficient Neil Young during a power-cord/occasional-riff solo. Smokey is lengthy, as are all of Banhart's albums, but make it to the last track and the reward is reminiscent of Banhart's infallible 2004 album, Rejoicing in the Hands. My Dearest Friend is only a couple of minutes long, but in that short time Banhart encapsulates the most resonant themes of this album and lets us see under the shroud of mystery. It's one of those moments in music when the smallest melodic motif melds perfectly with the sentiment of the lyric. Banhart tellingly whispers, "I'm gonna die of loneliness." This comes as a surprise from the often light-hearted, communal Banhart. It shows an ounce of insecurity, just what's needed to make Banhart human and Smokey refreshing.